Many activists appear to love internecine debates about language. Fights over the word “vegan” seem particularly addictive. Nearly every vegan has an opinion regarding the definition and use of this word, but the fundamental goals of those individuals often differ. Given the disparity of underlying motivations, it is not surprising that there is much disagreement. For many, “vegan” is an end in and of itself. The only thing that matters is using the word “vegan” and glorifying veganism. On the other hand, many activists are concerned with the real-world consequences of the words they use. These activists don’t want to use a specific word because they like it or because it captures their particular worldview. Rather, consequentialist activists choose language that influences the actions of those who currently eat animals. In this case, words only matter in as much as they actually reduce suffering. For the group that is primarily concerned about consequences, there are a number of studies to influence optimal messaging. For example, there is much to learn from Faunalytics’ large study of former vegetarians and vegans – which showed that more than 4 out of every 5 people who go veg eventually revert back to eating animals. A key strategic take-away from this survey is that people who change rapidly are less likely to maintain that change; those who take incremental steps are more likely to maintain that change. Another key lesson is that former vegetarians point to their inability to live up to the demands for “purity” from the certain portions of the veg community. The angry, judgmental attitude associated with the vegan community has driven away even highly-motivated, dedicated individuals, as we can see in this article. The University of Arizona restaurant and grocery store research group found that non-vegetarians are less likely to order a dish or buy a product if it is labeled “vegan,” compared to if the same product has a non-veg label (e.g., “vegan burger” vs “black-bean burger”). More recent studies have shown a 70% decline in sales of a product if it is labled "vegan"! We also have a number of recent data points, as new companies enter the marketplace and existing companies move into this space. What these firms have in common is a desire to reach new, non-veg individuals, rather than appeal to current vegans (a market so small it is within the margin of error). For these companies, non-vegetarians are their path to profits and success. The more companies succeed in having new people buy their products, the fewer animals will suffer and die. This article discusses the trend, and their lead graphic – a sign at Target (above) – shows the conclusion reached by profit-motivated companies seeking to reach non-veg audiences. 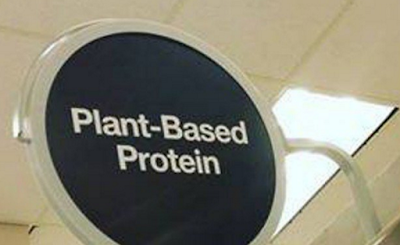 Their marketing research shows that “plant-based” is the phrase that will reach new people. Forbes magazine has a new article that explicitly addresses the debate about language. Of course, there are still those who are primarily and personally concerned with trying to alter the perception of the word “vegan.” But the major up-and-coming companies – such as Hampton Creek Foods and Beyond Meat, which are seeking to reach new people right now, as well as the existing multinationals moving into this space – have all clearly chosen “plant-based” as the way forward. I understand, and have written about, how inviting and even intoxicating it is to worry about words and defend definitions. It feels great to be part of an elite club, and ego is one of the most powerful drives, spawning the most amazing rationalizations. But if we care more about animals than ideology, and if we want to have the biggest possible real-world impact, we need to set aside our ego and use the most inclusive and persuasive language possible. What a potent final paragraph especially. Amen, Matt.